If you are searching for a beautiful and exclusive Orlando vacation home, close to Walt Disney World, golf courses and all the major attractions, our Orlando villa in Orange Tree is the perfect choice. Orange Tree is one of the most prestigious locations in the Orlando area and is the premier choice for discerning visitors. Situated 12 minutes drive from Walt Disney World, it provides a haven of peace and tranquility away from the bustling crowds. Our vacation home is within minutes of Lake Louisa State Park, where you will find nature trails, cycling, fishing and boating. Orange Tree offers its own five acre manicured grounds, including a soccer pitch, tennis courts, and basketball court and is surrounded by scented orange groves. For golfers, Orange Tree is the perfect choice, having numerous world-class courses within ten minutes drive of our home. Our Home: Our exclusive and luxurious villa has been constructed by award winning builders and the interior showcases the ultimate in American design. All our rooms have been professionally crafted, by an interior designer, to enable you to experience the excellence of a five star hotel, with the additional benefits of a private south facing pool and spa, four bedrooms, three bathrooms, two separate living rooms and a cordon bleu kitchen. We have made significant upgrades to the quality of the home including selecting cultured marble bathroom vanity tops and washbasins, marble whirlpool tub, ceramic tiled floors, and an extended swimming pool with an adjoining separate spa with seating for six people. 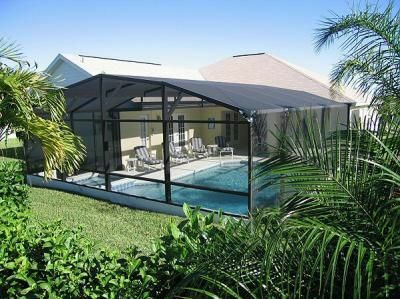 The pool and decking are south facing in order to take full advantage of the Florida sun, although shade can always be found under the covered lanai. We recently pulled out the carpet and replaced with wood laminate. Two of the bedrooms boast (US) King and Queen sized beds and have en-suite facilities including large walk-in showers and a whirlpool tub. Amenities: For your safety and security, we have installed the latest technology in our home including, childproof swimming pool screens, a centrally monitored security and fire alarm system and smoke detectors. A free high-speed broadband internet connection is provided for guests who wish to keep in touch with family or business. Our promise to YOU: Finally, for guests making a booking, the owner guarantees to personally oversee every aspect of the arrangements, from the time the first inquiry is received, to the time the villa is vacated. We intend that our villa will be one of the most impressive and best maintained properties in Central Florida and we hope that you will want to share it. Games Room in garage with pool/ping pong table, Dart board and Fussball table. Cleaning included in price upon departure. Kitchen Nook seats 4. Totally enjoyed my stay. We loves the location of the home and surrounding areas. The home was very spacious and clean. The amenities were very adequate for my family, it was homely and comfortable. House is great, everything as expected or better. My one comment is the driveway - it’s very steep and made getting into and out of our car difficult for or handicapped son and elderly Mom. If no mobility issues, you will love this house owner was very pleasant and easy to work with, she even made arrangements for an earlier arrival time as we misjudged how long our travel time would be. I would absolutely recommend this Home. Easy access to all the area attractions and yet far enough away to be out of the noise and tourist traps. clean home with a few stains on the carpet but expected for a older home . the kiddos had a blast with the pool and the pool table . we had a problem with the door alarm , but I emailed Caroline and she had a new one installed that day .this is a very nice place to stay . FYI there is NO smoking " so I went out the front door . there were 4 small snakes in the pool after the yard people left but we are from Texas so we just got them out and enjoyed the evening . no need to worries about crime , the police patrol the neighbor hood all day and night . Denney's restaurant is right around the corner with the 4.99 grand slam and the service was amazing . and the Wal-Mart souvenirs were cheaper than the shops . House pretty enough. Yard not as pictured. Furniture, beds uncomfortable, needed new everything. House wouldn't get cool. Got there grandchildren wanted to swim and pool was not working. Pool repairman came h next day put alot of chlorine in. He had working but shortly after stopped again. Was told repairman came out following day and had wrong part. Management said he let notice on door which was not there. He had to come back next day and finally fixed pool correctly. Glad we kept kids busy at parts and beach. Would not stay there again. I'm sorry our house did not meet your expectations. The beds have recently been replaced before your arrival and new sheets, towels and kitchen items replenished. A rental home takes a beating as you can imagine but we strive to maintain a high standard. I will certainly speak to the management company regarding your issues. The pool actuator unfortunately broke during your visit, this keeps the pool filtering water and keeps it clean. While it is regrettable the part was not available quickly it is beyond our control to have it fixed immediately. I did confirm with the management company it was working several days before your departure. Again, apologies for the problems you encountered and we hope you will give us a second chance in the future. Great property, great layout. Lots of room and plenty of amenities for both families. The home was well suited to our family of 7 despite a few issues. Caroline’s home is a nice Florida villa situated about 20 minutes from Disney. It was nice being a little further away from the noise, although the surrounding area lacks in shops and amenities. Many strips are abandoned though the Publix was close (but overpriced)! The owner, Caroline, was incredibly helpful and responsive! She even had pool towels purchased for our use. The house was clean and bug free save for some tiny little things by the sink...but I judge a Home by whether I see any gross bugs and I definitely did not! The beds weren’t the most luxury or comfortable but they did fine. The house is in need of some regular maintenance but I also understand people are hard on rental homes. The linens were old and worn and stained and the carpet could be cleaned. The pool was lovely but the management company gave us a runaround though we paid for pool heat. At first we were told we didn’t pay for it. Then we were told it was on and 70 was a reasonable temperature. Caroline to the rescue...it was turned on finally by a tech and was nice and comfortable the rest of the time. The family room furniture was so comfortable though this busy mom didn’t find out until the last day or so :) i would stay in this rental again. I felt safe and comfortable and it served our needs. Thanks Caroline!